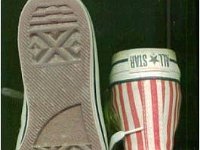 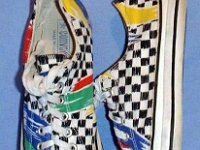 Photo gallery of chucks with geometric pattern print uppers. 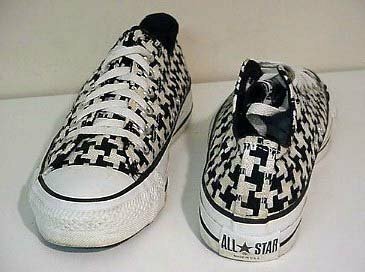 1 Chucks with Geometric Pattern Uppers Checkered high tops, inside patch and top views. 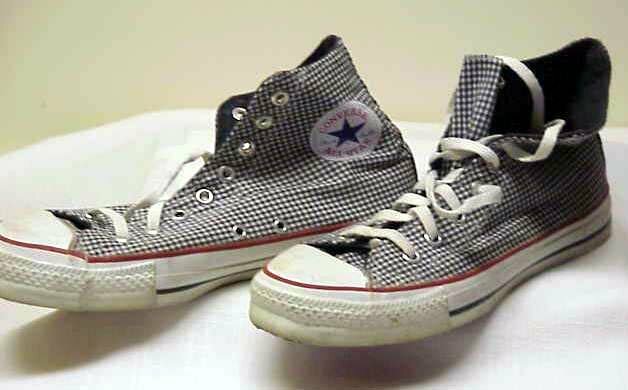 2 Chucks with Geometric Pattern Uppers Close up of the toe caps of a pair of checkered high tops. 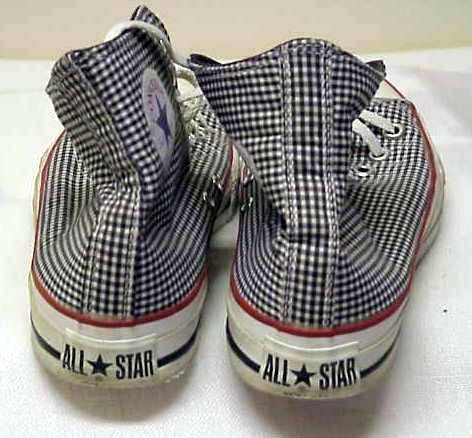 Notice the classic laces and stitching. 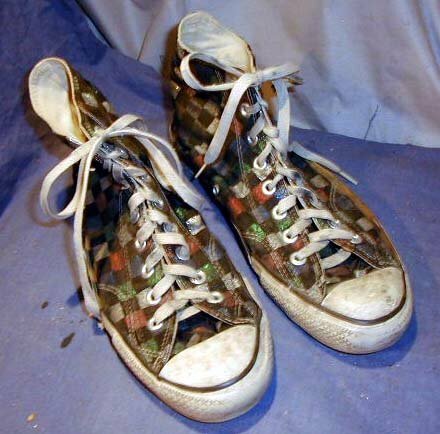 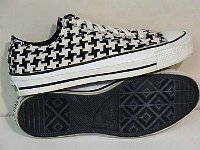 3 Chucks with Geometric Pattern Uppers Worn pair of checkered high tops, angled top view. 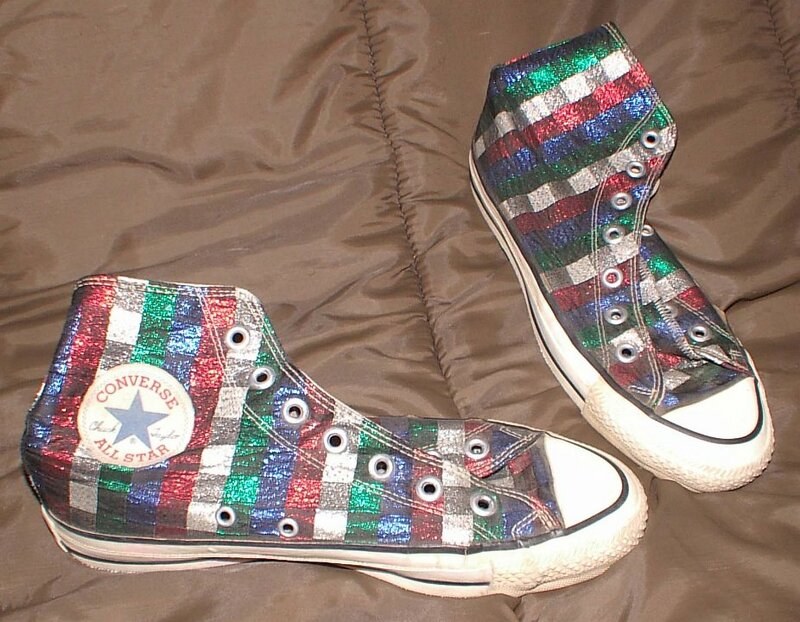 4 Chucks with Geometric Pattern Uppers Inside patch and angled top view of glittery checkered high tops. 5 Chucks with Geometric Pattern Uppers Rear view of grey and white finely checkered high tops. 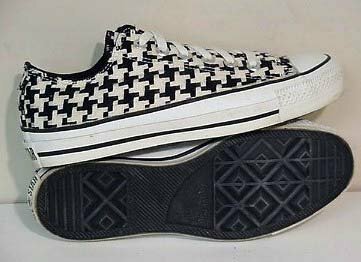 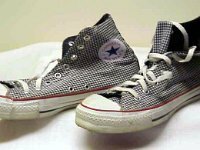 6 Chucks with Geometric Pattern Uppers Gray and white fine checkered high tops, made with optical white piping and foxing. 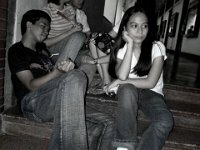 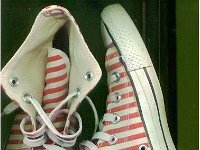 Angled side view. 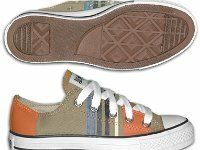 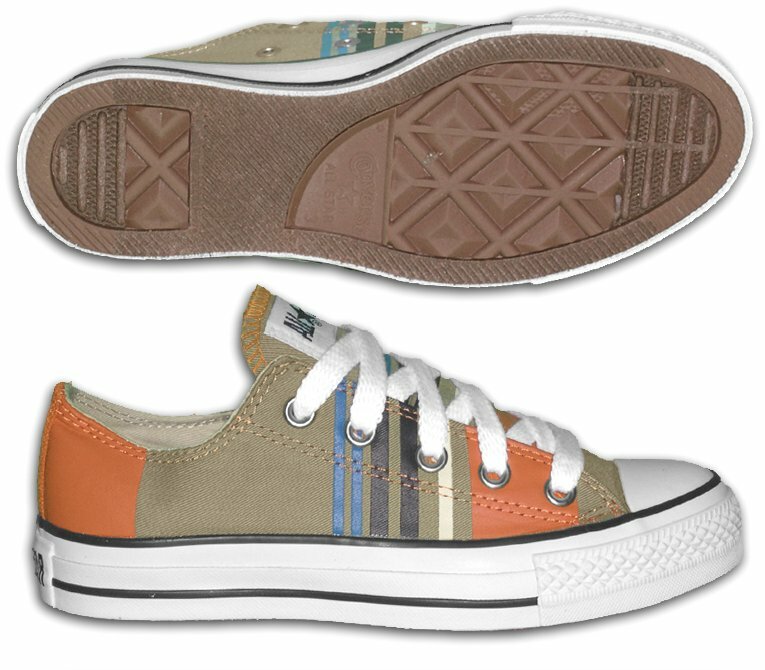 7 Chucks with Geometric Pattern Uppers Orange, grey, blue, and tan club print low cut chucks. 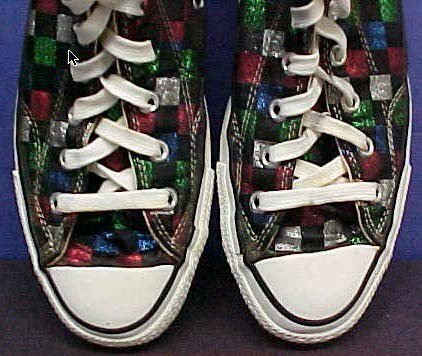 8 Chucks with Geometric Pattern Uppers Criss cross pattern low cuts, angled front view. 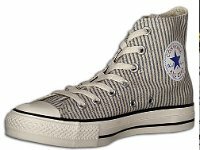 9 Chucks with Geometric Pattern Uppers Criss cross low cuts, front and rear views. 10 Chucks with Geometric Pattern Uppers Criss cross pattern low cut chucks, side and sole views. 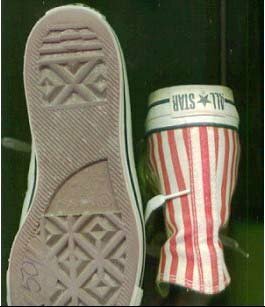 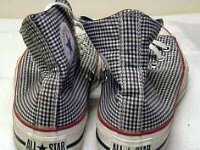 11 Chucks with Geometric Pattern Uppers Diamond jubilee high tops, inside patch and sole views. 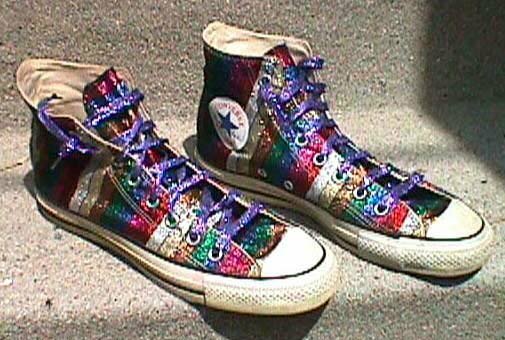 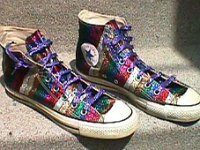 12 Chucks with Geometric Pattern Uppers Striped pattern high tops with glitter and purple laces. 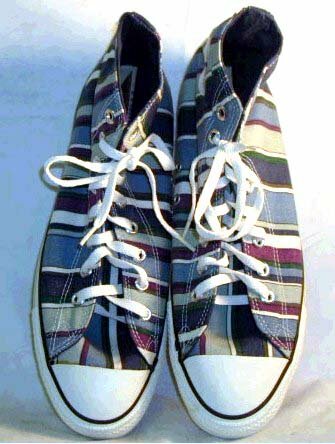 Angled side view. 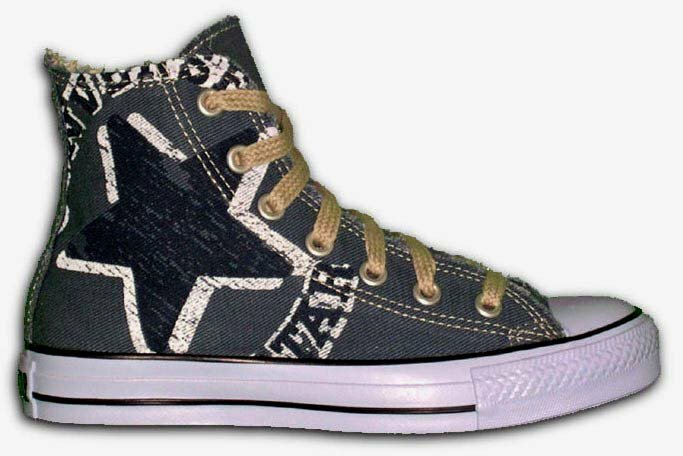 13 Chucks with Geometric Pattern Uppers Graphic star denim high top, outside view. 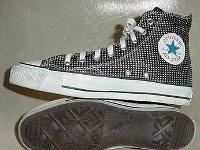 Note the gray foxing on the shoe. 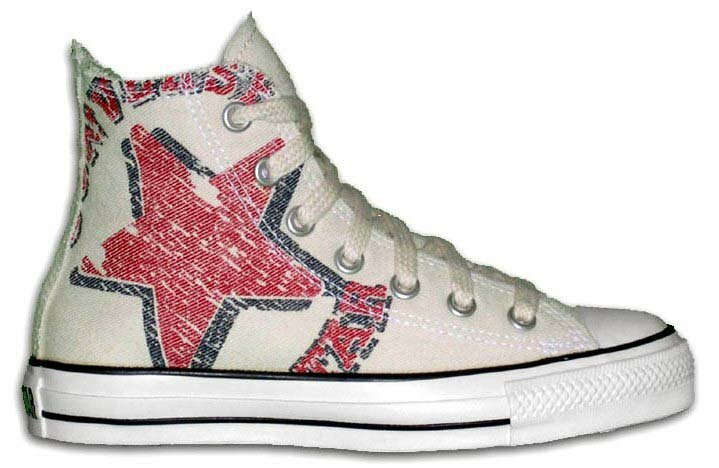 14 Chucks with Geometric Pattern Uppers Off white graphic star high top, outside view. 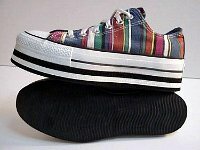 15 Chucks with Geometric Pattern Uppers Striped platform low cuts, angled side view. 16 Chucks with Geometric Pattern Uppers Striped platform low cuts, front and rear views. 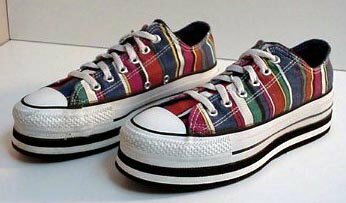 17 Chucks with Geometric Pattern Uppers Striped platform low cuts, side and sole views. 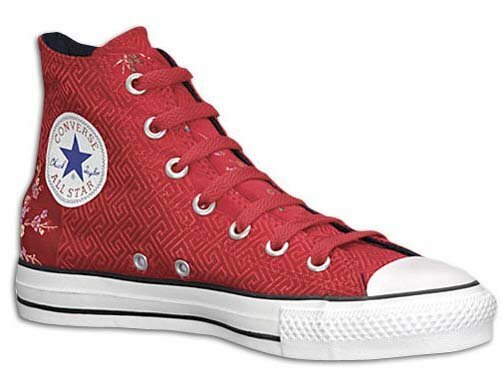 18 Chucks with Geometric Pattern Uppers Angled inside patch view of a red Asian print high top with embossed square patterns. 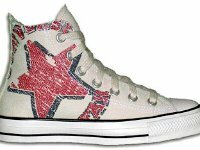 19 Chucks with Geometric Pattern Uppers Peppermint candy striped high tops, patch and top views. 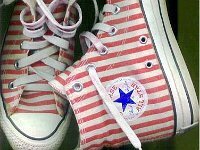 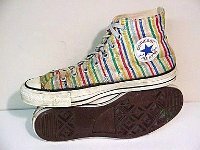 20 Chucks with Geometric Pattern Uppers Peppermint candy striped high tops, inside sole and side views. 21 Chucks with Geometric Pattern Uppers Peppermint candy striped high tops, rear patch and sole views. 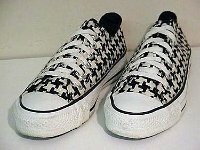 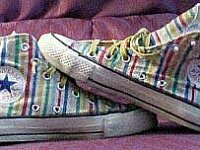 22 Chucks with Geometric Pattern Uppers Worn striped pattern low cuts, top view. 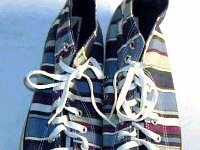 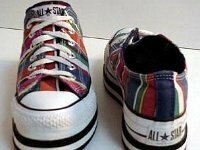 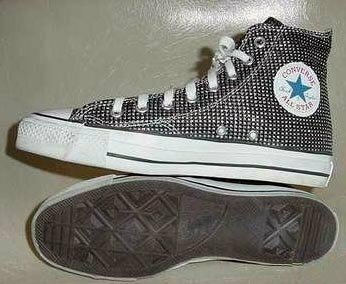 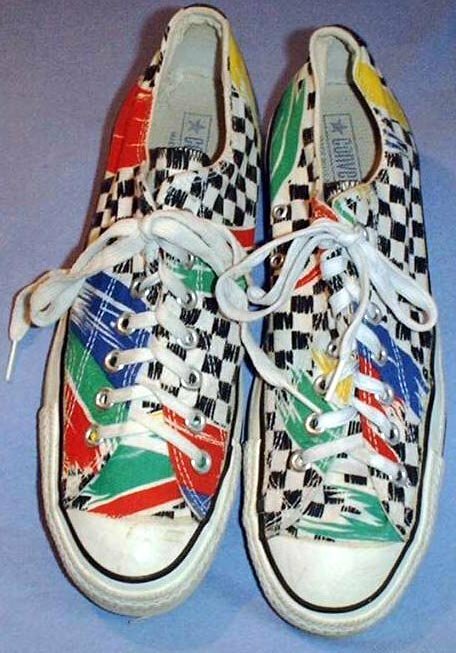 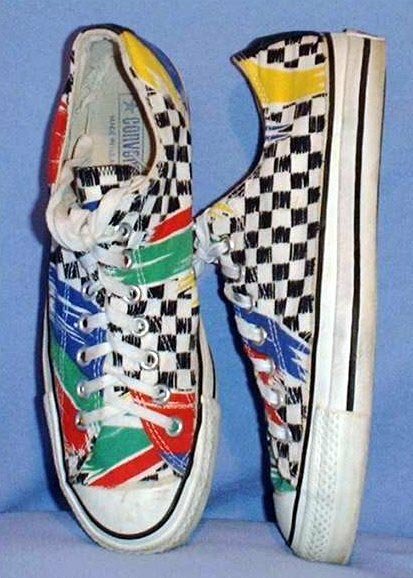 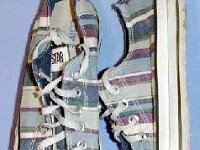 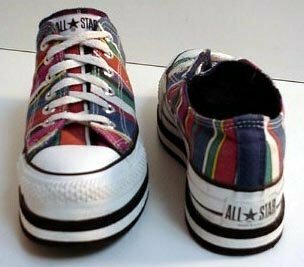 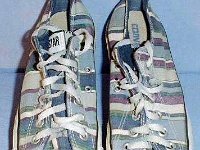 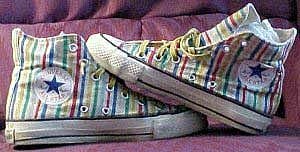 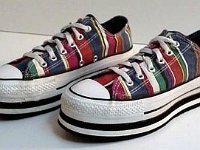 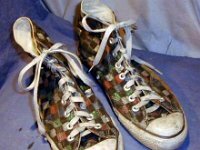 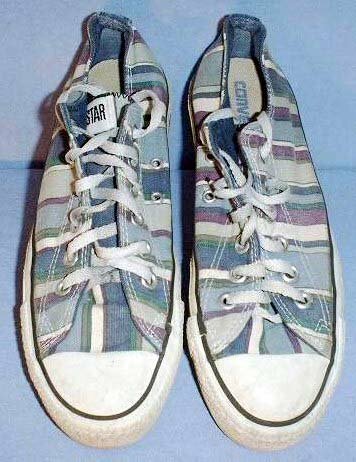 23 Chucks with Geometric Pattern Uppers Worn striped low cuts, side and top views. 24 Chucks with Geometric Pattern Uppers Cardinal red and navy blue variable striped pattern high tops, inside patch and sole views. 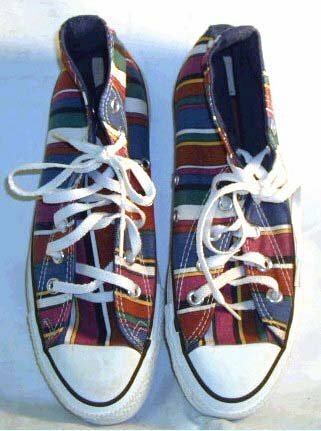 25 Chucks with Geometric Pattern Uppers Cardinal red and navy blue variable striped pattern high tops, top view. 26 Chucks with Geometric Pattern Uppers Blue and olive variable striped pattern high tops, inside patch and sole views. 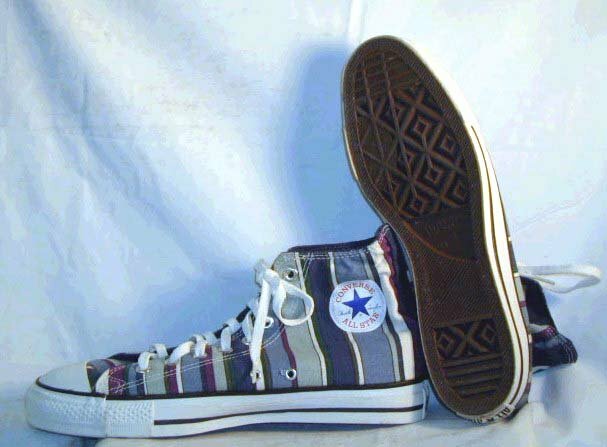 27 Chucks with Geometric Pattern Uppers Olive and blue variable striped high tops, top view. 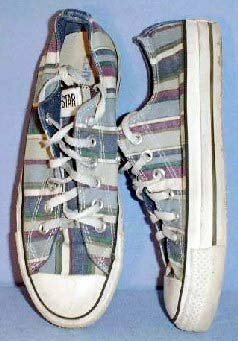 28 Chucks with Geometric Pattern Uppers Spot color shot of teens wearing striped and flower pattern high tops. 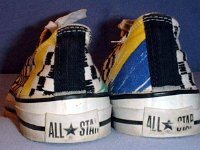 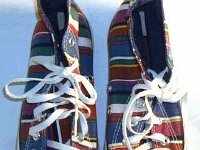 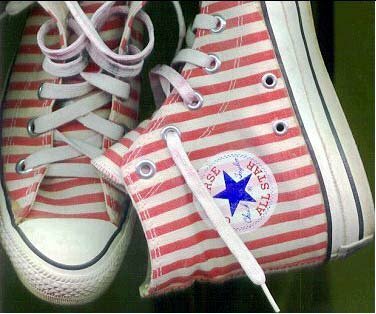 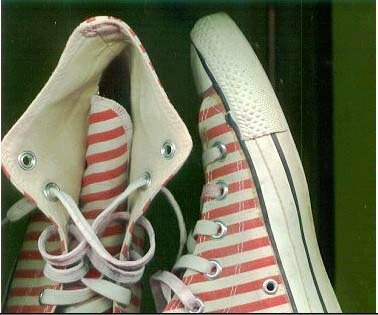 29 Chucks with Geometric Pattern Uppers Candy stripe high tops, inside patch views. 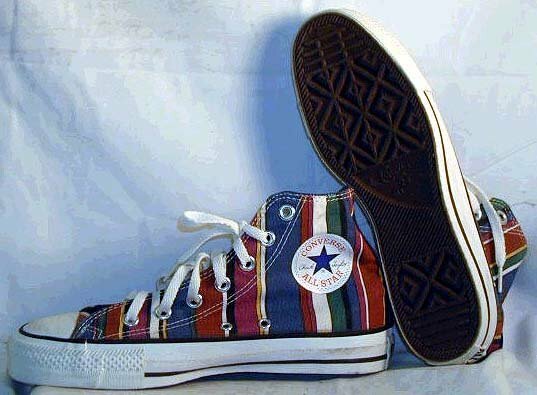 30 Chucks with Geometric Pattern Uppers Candy striped high tops, inside patch and sole views. 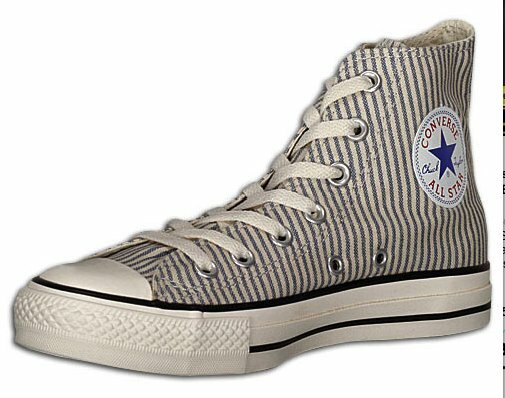 31 Chucks with Geometric Pattern Uppers Angled inside patch view of a right striped denim high top. 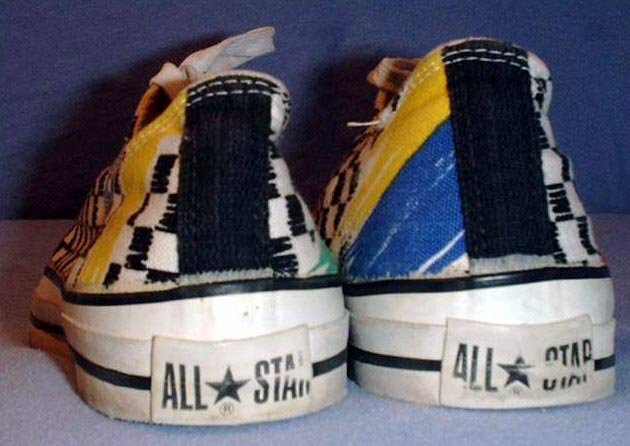 32 Chucks with Geometric Pattern Uppers Angled inside patch view of a left striped denim high top. 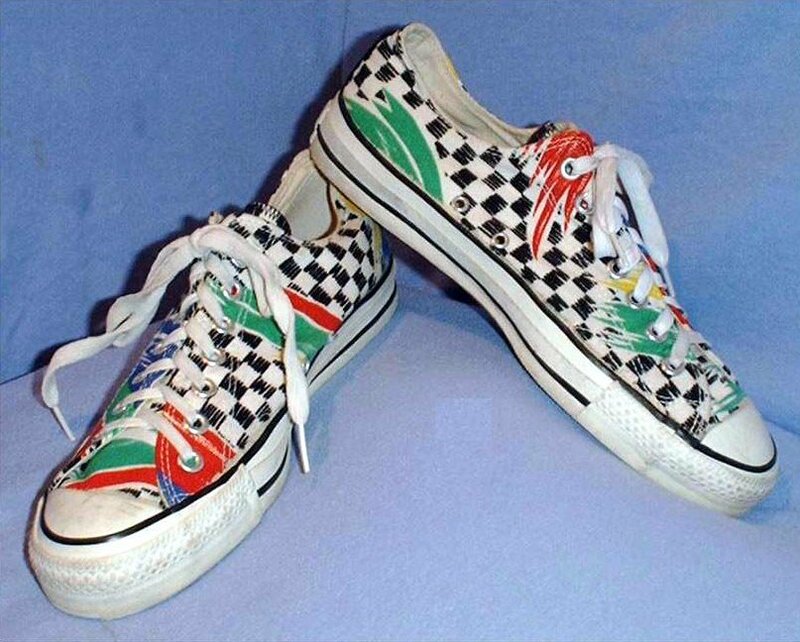 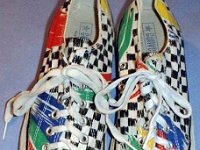 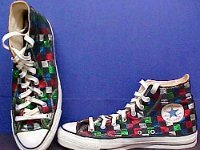 33 Chucks with Geometric Pattern Uppers Checkered tropical pattern low cuts, angled side views. 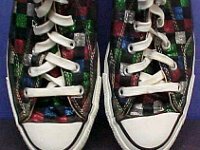 34 Chucks with Geometric Pattern Uppers Checkered tropical pattern low cut, top and side views. 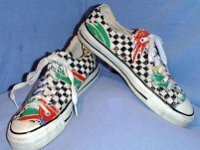 35 Chucks with Geometric Pattern Uppers Checkered tropical pattern low cuts, top view. 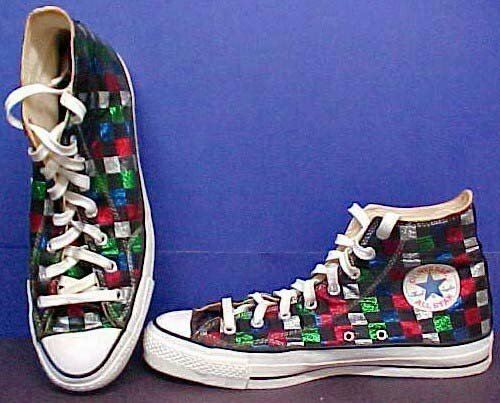 36 Chucks with Geometric Pattern Uppers Checkered tropical pattern low cuts, rear patch view. 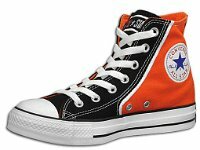 37 Chucks with Geometric Pattern Uppers Angled inside patch view of a right black and orange high top. 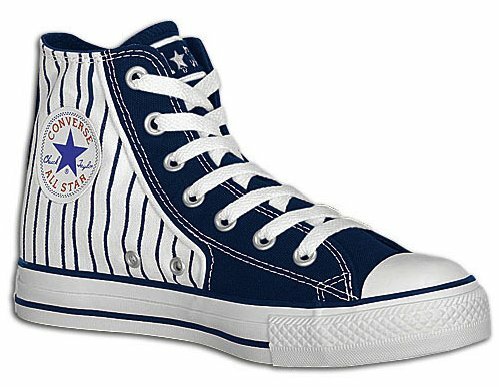 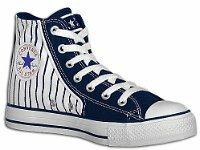 38 Chucks with Geometric Pattern Uppers Angled inside patch view of a left navy blue and white striped high top. 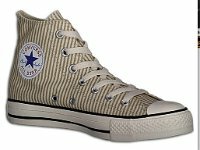 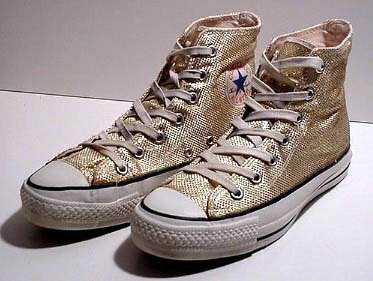 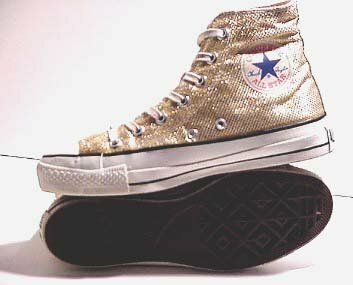 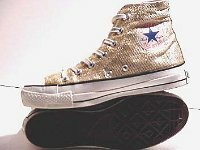 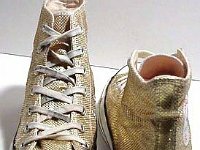 39 Chucks with Geometric Pattern Uppers Woven gold pattern high tops, angled side views. 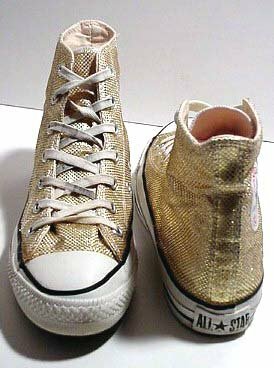 40 Chucks with Geometric Pattern Uppers Woven gold high tops, front and rear views. 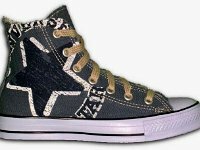 41 Chucks with Geometric Pattern Uppers Woven gold pattern high tops, inside patch and sole views.